Surrounded by green and a cat’s eye to kill for, the Anaconda Contact Lenses by ColourVUE will make those around you squirm with fear. The vertical black cat’s eye pupil alone will get attention and the deep green of the background is eye catching and bright. 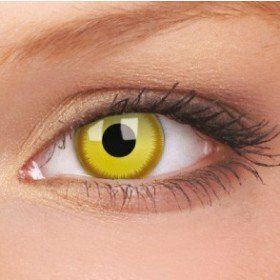 The lenses are wonderful for many occasions and can be worn repeatedly for a year.